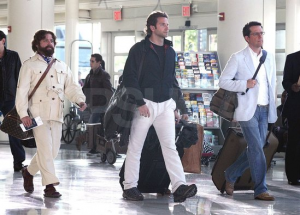 The Hangover Sequel Teaser Trailer Is Here And Ready To Get Us Drunk!!! The hit comedy The Hangover has a sequel now and that sequel now has an official teaser trailer. It is of course a tease. Not much to see really. It promotes the first film quite a bit, but none the less it got me excited to see the next film. CLICK HERE TO SEE THE TRAILER IN GLORIOUS QUICKTIME!!! The film will open on Memorial Day. ‘Anchorman 2’ Has A Teaser Trailer!!! This entry was posted on Thursday, February 24th, 2011 at 2:16 pm	and is filed under Film, News. You can follow any responses to this entry through the RSS 2.0 feed. You can skip to the end and leave a response. Pinging is currently not allowed. « Director Paul Greengrass Takes A Trip To “Memphis” For His Next Film!!! What were you doing out there? I could have killed you. Nah, actually, I positioned myself right in front of you, 'cause from the way your swings were goin', I figured that was the safest place.